A recent event held by Amazon Business gave procurement professionals the chance to join a dialogue with leaders in their field. In this post, we recount key highlights from the discussion about managing tail spend. On stage were John Proverbs, Head of Procurement at KLA-Tencor, and Amir Jafari, VP of Finance and Corporate Controller at ServiceNow. What are some of the challenges you face around managing tail spend? Proverbs: The tail often gets the least priority. We've always wanted to figure out a magic pill for it because the tail is actually quite expensive. We're buying a lot of things from many different suppliers, and it can be hard to know if you’re getting it at the right price, or the right quality, or with the right delivery terms. We’re a six-thousand-person company, but we don’t have twenty or thirty procurement professionals to go chase those issues for everything people buy. Jafari: The definition of a strategic vendor is the first thing we try to go after, to make sure everyone agrees on what that means and how we manage it. At the same time, we want to enable the entire user base to buy from whoever they want for other types of spend. That can become challenging. We have around 2,800 vendors at this point, and at the rate we’re adding them it becomes inefficient to manage. Proverbs: It’s not the amount of tail spend that’s important, it’s the number of items and suppliers to manage, the friction, and the poor customer experience. What’s your approach for improving how you manage tail spend? Proverbs: In the last couple of years it’s been wonderful seeing the emerging trends that are allowing us to manage the tail better without spending a lot of money on programs, projects, and headcount. I have three priorities in this area. Number one is customer experience. People aren’t going to use your system or your purchase card unless it’s easy for them. Two, we want to make sure it’s done in a competitive way. And three, because we are a large company, we want it to be compliant. It’s imperative for us to continuously try to revamp our procurement systems to make sure all six thousand of our users are having a good experience for the things they need to buy. Jafari: Data is going to become increasingly important in this area. Unfortunately, the data people have isn’t very good today. It’s hard to turn into intelligent analytics or predictive insights. We’re trying to lay down a foundation from a systems and process perspective that enables us to make data-based decisions. Our goal is to start making the data predictive, where we can improve employees’ purchasing experiences, for example by helping them buy long tail items automatically on a recurring basis? We want to help them spend more of their time doing what their passion is. How do you see things changing in tail spend management in the next few years? Jafari: Over time, we want to make it so that we just manage the vendor relationship—with Amazon as an example—and they take care of the back end, provide a great user experience, and the product shows up at the door when the buyer needs it. Proverbs: We have an opportunity to change how users experience procurement. You end up with a lot of suppliers and a lot of parts and requisitions and POs. I expect there will be growth in the area of integrated suppliers that manage suppliers and demand for you. You only pay them once a month, one requisition, one PO a month. They manage customer experience, competition, and compliance. That will help consolidate more tail spend and drive executive buy-in. Create a free account to experience how Amazon Business helps you consolidate spend with a solution users love. 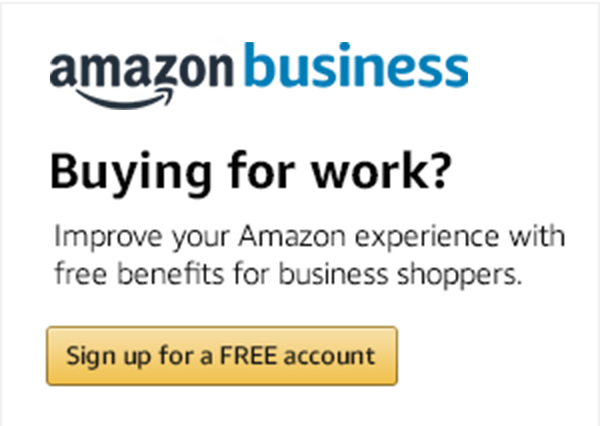 Visit amazon.com/business.